No matter what method you use to make them, leg warmers are simple to make and fun to wear. They make fun gifts, especially for dancers or anyone with a retro style. Use this free pattern to crochet a pair of leg warmers or try one of the other methods to create these funky accessories. This crochet pattern is perfect for a beginner and one pair can be completed in just a night or two. Whip up a few as last-minute gifts for your favorite gal pals. Click on the pattern below to download and print the PDF pattern using Adobe. These crochet leg warmers are meant to be worn over jeans and/or boots, and their finished size will fit most adult women. If you want to wear them over leggings, have bigger or smaller legs than most, or would like to make them for a child, here are some easy tips for altering the size. Add or subtract the amount of cuff rows needed to fit around the leg. Change the number of stitches needed for each leg round to match the new number of cuff rows. Use larger or smaller hooks than what are called for in the pattern. This technique doesn't require alterations to the number of pattern stitches or rows, but one entire cuff would have to be completed before sizing could be achieved. At that time, if the size isn't right, your choices would be to start over with another size hook, or keep the finished cuff but remove or add rows as in the first tip. No matter what your preferred method of textile crafting is, there is probably a pattern for creating leg warmers. These easy leg warmer patterns use a variety of techniques. One is sure to fit your expertise or crafting comfort level. Sewing - Crochet n Crafts shares a wonderful tutorial on sewing leg warmers using soft fleece fabric. This is a quick project that would be ideal for teaching children the fundamentals of using a sewing machine. Knitting - If you are new to knitting, Midnight Knitter has a simple pattern that uses basic stitches to complete. 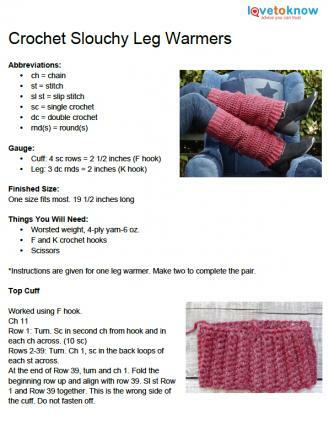 Knifty Knitter - If you are not a traditional knitter, try this pattern from Knifty Knitter Weekly. The Knifty Knitter looms lay on your lap as you wind and loop the yarn around pegs. This technique is fast and will allow even young children to achieve success. Recycling - Don't throw out those old sweaters! Recycle them into leg warmers. Try the pattern at Fireflies and Jellybeans to transform the sleeves of an old sweater into leg warmers that you or your favorite teenage girl will love. This tutorial requires minimal sewing skills and can be completed in less than an hour. Try one or all of these leg warmer projects any time of the year. Since each project takes minimal time to complete, you could create an impressive stockpile of gifts for any holiday or special occasion.